Cooper: Are You a Brainless Obeyer? Read ’em both, along with Mike’s latest re one of AmSoc’s main propaganda organs. Anyone experienced in government affairs will tell you that the people in the middle and upper-middle tiers of a bureaucracy are the ones who, as drafters and implementers of policy decisions taken at a higher pay grade, can really create havoc. Give a thoughtful read to this article on who the Obamessiah is putting into those crucial staff and line positions. Poster translation: Let’s accomplish the plan of great deeds! By now, you have read both the “Holder sez AWB2 and copkiller bullet ban” and “Pelosi imitates NRA and sez ‘enforce existing unconstitutional gun laws'” stories. Ostensibly pro-2A folks are laying out how Wayne and Chris are gonna save all the NRA members, as long as everyone donates more money. 2) There’s gonna be a fight. Expect lots more on #3 in the coming weeks. And no, you can’t make the image go away, once your minds absorbs it and the necessary inferences to be drawn from it. Sneaky Back Door Gun Grab in Obama Budget? Keep an eye out for this when Barack Obama releases his budget blueprint later this week. What these Democrats can’t accomplish in the open they’ll always try to slip through the back door. “A potential legislative gun rights battle looms today in Washington, D.C.,” says Washington senior rights activist John M. Snyder. “When President Obama submits his budget blueprint this week, reports indicate the proposal may include language designed specifically to repeal the Tiahrt Amendment,” says Snyder, named the senior rights activist in Washington by Shotgun News. “This repeal is an objective long sought by gun-grabbing politicians, the anti-gun Brady Center to Prevent Gun Violence and other extremist groups,” he added. The Tiahrt Amendment, named for Rep. Todd Tiahrt of Kansas, is included in the annual appropriations for the Bureau of Alcohol, Tobacco, Firearms and Explosives of the U.S. Justice Department. It prohibits gun-grabbing mayors and other repressive officials from obtaining federal gun trace data intended for use only for law enforcement purposes and using the data instead in harassing and costly third-party civil lawsuits against the firearms industry. Snyder says, “Anti-right to self-defense extremists such as New York City Mayor Michael Bloomberg and others seek to undermine law-abiding Americans’ gun rights by making it more and more difficult for them to obtain the firearms they want. Repeal of the Tiahrt Amendment would further their purposes. On Friday, The New York Times editorialized for repeal. The Democrats have repeatedly lost on gun issues over the years, but they’ll never give up trying to disarm the law-abiding public. Some folks remember what happened the last time Democrats went all out against gun rights and the NRA. It wasn’t pretty. Do they Democrats want to revisit that disaster? The reports I have read about Obama’s speech last night lead me to believe that a new AWB is not a primary objective for him, simply because he has stacked so many other “progressive” programs on his plate. I plan to read the full transcript as linked above tonight so as to better inform that speculation. But — and it is a huge “but” — I have every confidence that he will not oppose any action by Congress that tightens the screws on American gun owners in any way. That’s the point, IMHO, of the cited article. Re that article, I do believe that the author has not yet grasped that we live in a post-Constitutional age, where the socialists in charge (from either party) either already have or can get enough votes to do pretty much what they want, eventually. The vision that the useless Socialist-Lites of the Republican Party can reclaim Congress in 2010, just as they did in 1994, is likely to be viewed by history as less of a vision and more of an hallucination. As is any thought that, with the current cast of degenerates, charlatans, and powerbroker-wannabes, it would make any difference if they did. Best to get ready for a decade on the run — perhaps quite literally. > Print a hard copy and save a soft copy of this document immediately, please. Then read it, think, and read some more. When you’re done, pass it on to others as you practice its lessons. > Mike’s latest, derived from his work on “Absolved”. grenades and related devices, as well as training programs for each. The hard copy I purchased recently is dated June 2005, with a change letter dated 27 November 2006. The online version above is from 2000, so any devoted readers are urged to obtain the most recent copy of the FM that you can. Along with the details on the care, feeding, and use of current US grenades, the appendices also feature drawings and specifications of common NATO and OpFor grenades. NOTE: The following is copyrighted by Rob Hanus and is used here with permission. You can find the original document here: http://www.thepreparednessblog.com/capability-checklist – which is also where it is kept updated. Goal of this project: To develop a Capability Checklist – a tool that we can use and fallback on to measure our preparedness. A quantitative method to ensure that we are making forward progress in our preparations, and a tool to make sure that our existing preps stay up to date. This checklist will be kept updated in this location. Each capability normally applies to each person you are preparing for, though some consideration should be given to those capabilities that would apply to a whole group (user discretion). The plans for expedient antennas is for reference. You should practice building these antennas. Hard currency amounts at your discretion. Minimum-prepared foods are those that require little or no cooking before eating. Flatware means plates, bowls, cups, spoons, forks, knives, napkins, etc. The idea of disposable flatware is to reduce consumption of water and is typically for shorter-term events. Those with extended capabilities for alternate energy and water will have less use for disposable flatware. Oils: make sure you have enough oil, lard, etc. on hand to cover the increase in pan-cooking. Document with pictures and/or video all possessions for insurance purposes, including writing down the serial numbers for guns and electronics. Post in a quick-access location the numbers for all emergency services (police, fire, ambulance, poison control, utility services), and include non-emergency numbers for the same services as well as family, friends, neighbors, etc. A “last-minute checklist” is generally a bad thing to implement. It’s better to have all the equipment and supplies on hand before an event occurs. A Grab List is a list of items that you want to take with you in case you need to evacuate your home. The grab list should include everything that you would want to take, in priority order, so that you don’t have to try and remember while you’re scrambling to evacuate. Additional Entertainment considerations include games for kids, books (or reading material) for both education and learning resources, and books that show how to play more games (adult and children) using cards and other materials. Entertainment items such as DVDs and CDs require the use of additional electronics and power, see appropriate categories. A “Trigger Point” is an event that you have pre-determined that will cause you to enact certain parts of your plan. For example, When virulent H5N1 reaches Canada or Mexico, your plan calls for you to do XXXX (whatever that might be). Provide power to all normal light for home with Alternative Energy. Air filtration system filters needs to be at least HEPA and possibly ULPA. Tested recipes for pet food from stored and/or gathered food sources, food scraps, etc. Ability to repair and maintain your home: Plumbing, Electrical, Carpentry, Roofing, Fencing, Concrete, Welding, etc. Know how much water each person consumes per day while performing strenuous activity; use this to calculate how much water you need. *A dedicated “dirty water” container is what you use to collect and store raw water before you purify and/or disinfect it. They should always be kept separate from “clean water” containers. A spigot-controlled water supply can be as simple as an Aquatainer. “Gray Water” is water from sinks and showers that can be used for gardening, flushing toilets, etc. “Minimum Capabilities” – the basic set of capabilities that a person starting out should strive to achieve as soon as possible. “Extended Capabilities” – what we need to works towards and, once there, maintain; though every bullet point in the Extended Capabilities list may not apply to everyone. I’m looking for suggestions and feedback, so don’t be shy; please jump right in and let me know what you think. Also very much worth your time is this article, which contains, among other important information, an extended discussion of the “rule of threes”. JPFO interviews author Mark Spungin about his recent novel ‘Neither Predator Nor Prey’ here via audiolink and here via transcript. An excerpt from ‘Neither Predator Nor Prey’ can be found here, and you should order your copy (plus extras for your friends!) here. Imagine a series of tactical lessons in invisible resistance, as taught by a master rifleman, wrapped into a smashing novel. Rated five out of five stars on the Sipsey Street scale, with an extra asterisk for really creative ways to dispose of dead bodies, ‘Neither Predator Nor Prey’ is a must read for Three Percenters. War is just a racket. A racket is best described, I believe, as something that is not what it seems to the majority of people. Only a small inside group knows what it is about. It is conducted for the benefit of the very few at the expense of the masses. It may seem odd for me, a military man to adopt such a comparison. Truthfulness compels me to. I spent thirty- three years and four months in active military service as a member of this country’s most agile military force, the Marine Corps. I served in all commissioned ranks from Second Lieutenant to Major-General. And during that period, I spent most of my time being a high class muscle- man for Big Business, for Wall Street and for the Bankers. In short, I was a racketeer, a gangster for capitalism. Read more in General Butler‘s book, War Is A Racket, available online. >Keyes: How Can a Bankrupt Government Save a Bankrupt Banking System? > Alan Keyes, as vid-posted on Yhetti. In detail, how do the decentralized pro-freedom, anti-collectivist forces collect, evaluate, and disseminate useful (i.e., timely, accurate, actionable) intelligence information to help like-minded individuals and groups in their struggle to restore political liberty and personal freedom? A commenter during the Iowa National Guard brouhaha mentioned that an S-2 function needs to be developed. It’s rubbish. I guarantee you: everybody talking about this is going to make sure the monster is fed next April 15th and they cannot wait to get in line and vote again. By the time these people get their stupid tea-bags in the mail, Amsoc will have achieved whole tactical and strategic leaps and bounds toward the commanding heights, and the slow-motion socialist revolution will have made another turn of its great wheel: the fait accompli in place. I am not fooled by the noises of people who no longer live reality but, instead, every hollow metaphor that they can get between them and reality. And when I look to history for men of action and find their “lives, fortunes, and sacred honor” have come down to this, I get sick at my stomach. With every passing year, my conviction on my own epitaph becomes that much more determined. It’s hard to believe: that I have lived in the same times with such craven punks, who can satisfy themselves so cheaply. Here is Robert LeFevre’s classic argument (1959) for a purely free society, the essay that made him a leading, if controversial, spokesman for the libertarian position on government and society in the 2nd half of the twentieth century. He argues that government is in its essence a violation of rights, one that makes life brutal, poor, and short. He demonstrates that no government anywhere has lived up to its basic promises, and calls on all people to contribute to building a new kind of freedom. Why all of this emphasis on political theory? At present, we are wobbling between points 1 and 2. Very few people are thinking about winning the battle against transnational socialism, so we’ll be talking more about that topic in the coming weeks. But I think it even more important to consider a fourth point while we plan how to crush our enemies. Let’s say we pull it off, over whatever geography and time scale it takes. We can and should talk about the foundational trilogy (DoI, USC, and BoR). However, the fact that AmRev3 is in its opening throes suggests strongly that mere reversion to the Founders’ works will not be sufficient either to secure our victory or to prevent tyranny from sprouting anew from its shattered remnants. Hence the libertarian theory. LeFevre comes highly recommended, and it behooves those of us who will hacking away in the upcoming struggle to have a firm grounding in why we are fighting. Killing your oppressors is both necessary and good — but ensuring that you have done all you can to prevent their reincarnation is even more important. Take the time to read each of LeFevre’s chapters, and think how it might (or might not) soon apply to the area known as the Former United States of America. >Grigg: Triumph of the "Quangocrats"
> William Grigg takes a look at the neglected question of how, at the same time private industry is shedding hundreds of thousands of jobs each month, those millions of “public servants” hanging from the taxpayers’ teats are enjoying both job security and prodigious pensions. In socialist Britain, as in the corporate socialist (that is, fascist) USA, private sector businesses that actually produce desired goods and offer useful services are shedding jobs by the million; private citizens are cinching in their belts and — as their retirement plans evaporate — contemplating the prospect of ending their days by expiring with their noses still firmly attached to whatever grindstone is still operating in this economically blighted land. > With last week’s brouhaha over the Iowa National Guard’s planned weapons confiscation drills and the subsequent cancellation of those exercises, I thought it might be useful to review some circumstances under which American troops have followed what were facially legal orders from their command structure. Note that I yield to no one in my thanks for the efforts and sacrifices made by American military men and women in defending Americans from foreign enemies. – which was consistent with the SCOTUS majority opinion in Heller supporting bans on “dangerous and unusual weapons” (see Heller slip opinion at 55). Army Chief of Staff and Major General Douglas MacArthur watched a brigade of steel-helmeted soldiers precisely align themselves in a straight four-column phalanx, bayonets affixed to rifles. He nodded his head in satisfaction. Discipline was wonderful. Up ahead, Major George Patton kicked his heels against his mount, and the big horse reared forward to signal a line of cavalry. The riders drew their sabers, and the animals stepped out in unison, hoofs smacking loudly on the street. Five Renault tanks lurched behind. Seven-ton relics from World War I and presumably just for show, the old machines nonetheless left little doubt as to the seriousness of the moment. On cue, at about 4:30 p.m. on July 28, 1932, the infantry began a slow, steady march forward. Completing the surreal atmosphere, a machine gun unit unlimbered, and its crew busily set up. This was no parade, although hundreds of curious office workers had interrupted their daily routines to crowd the sidewalk or hang out of windows along Pennsylvania Avenue between the White House and the Capitol to see what would happen. Up ahead, a group of weary civilians, many dressed in rags and ill-fitting, faded uniforms, waited in anticipation amid their sorry camp of tents and structures made from clapboard and sheets of tin covered in tar paper. Some loitered in the street. They had heard something was afoot — expected it after what happened earlier. Now, a murmur rose from the camp crowd. Upon seeing the Army’s menacing approach, they were momentarily stunned, disbelieving. Recovering their senses, a few of the men cursed and sent bottles and bricks flying toward the troops — ineffective weapons against so formidable a force. The missiles shattered on impact on the hard pavement or bounced off the flanks of horses and soldiers. Undaunted, the roughly 600 troops maintained their discipline with tight-lipped determination. The extra training MacArthur had recently ordered was paying off. MacArthur could not help being euphoric. If the tactics were not textbook, the results were everything he hoped for — a complete rout. The troops had exercised perfect restraint in completely clearing the downtown area without firing a shot. Within hours it was all over. Troopers set the abandoned camp ablaze as the former inhabitants retreated, demoralized and beaten, across the Third Street bridge. MacArthur called a halt to allow his troops to rest and eat while he considered his next move. As many as 20,000 former soldiers and their families had converged on Washington in the summer of 1932, the height of the Great Depression, to support Texas Congressman Wright Patman’s bill to advance the bonus payment promised to World War I veterans. Congress had authorized the plan in 1924, intending to compensate the veterans for wages lost while serving in the military during the war. But payment was to be deferred until 1945. Just one year earlier, in 1931, Congress overrode a presidential veto on a bill to provide, as loans, half the amount due to the men. When the nation’s economy worsened, the half-bonus loans were not enough, and the unemployed veterans now sought the balance in cash. Known as Bonus Marchers, they came in desperation from all across the nation, hopping freight trains, driving dilapidated jalopies or hitchhiking, intent on pressuring Congress to pass the legislation. The administration vehemently opposed the measure, believing it inflationary and impractical given the $2 billion annual budget deficit. At first the march was a trickle, led by Walter Waters, a 34-year-old former sergeant from Portland, Ore. It soon became a tidal wave, drawing national press attention. The first contingent reached the nation’s capital in May 1932. They occupied parks and a row of condemned buildings along Pennsylvania Avenue, between the White House and the Capitol. When new arrivals overflowed that site, they erected a shantytown on the flood plain of the Anacostia River, southeast of Capitol Hill. Theirs was a miserable lot, alleviated somewhat by the beneficence of the city’s superintendent of police, Pelham Glassford, himself a war veteran. Glassford pitied the beleaguered itinerants and solicited private aid to secure medical assistance, clothing, food and supplies. During a May 26 veterans meeting, Glassford suggested they officially call themselves the Bonus Expeditionary Force. Adopting the name — which was commonly shortened to Bonus Army — they asked him, and he agreed, to serve as secretary-treasurer of the group. Working together, Waters and Glassford managed to maintain enough discipline and order in the ranks to ward off eviction. Glassford likely hoped that the horde would eventually lose interest and return home, but Waters had other ideas. ‘We’ll stay here until the bonus bill is passed,’ Waters told anyone who would listen, ’till 1945, if necessary.’ He staged daily demonstrations before the Capitol and led peaceful marches past the White House. President Herbert Hoover refused to give him an audience. In June the House of Representatives narrowly passed the Patman bill, but the Senate defeated the measure with a lopsided vote of 62 to 18. Congress was scheduled to adjourn in mid-July, and about one-quarter of the veterans accepted the government’s offer of free transportation home. Hoover had apparently won. Perhaps now he could concentrate on an economic recovery plan and the upcoming reelection campaign. But many of the marchers felt betrayed and disillusioned. With nowhere else to go, they decided to stay. Ominously, their disappointment festered in Washington’s muggy summer heat. To complicate matters, at this point the American Communist Party saw an opportunity to cause trouble, and sent forth John Pace as the catalyst with instructions to incite riot. The degree of his success is uncertain and will be forever a matter of debate, but his presence alarmed the Washington power structure. Historian Kenneth S. Davis theorizes that Pace may have had a hand in escalating the tensions, goading the angry veterans to become more aggressive. A more plausible explanation for rising tension may simply be that frustrations finally reached a boiling point. In any case, Secretary of War Patrick Hurley had had enough. On July 28 he ordered Glassford to immediately evacuate the occupied buildings, which were scheduled for demolition to make way for new government offices. The veterans stubbornly refused to budge. For whatever reason, Glassford and his police officers became the target of bricks and stones, and one officer suffered a fractured skull. As the melee got out of hand, an angry veteran, apparently feeling that Glassford had betrayed the Bonus Marchers, tore off the chief’s gold police badge. Fearing for their safety, police opened fire, killing one veteran and mortally wounding another. The officers retreated while Glassford sought the advice of his Board of Commissioners. Quick to pass on the responsibility, and perhaps overreacting, the commissioners called the president to deploy the Army from nearby Fort Myer to restore order. Describing the attack on police as a’serious riot,’ the commissioners asserted, ‘It will be impossible for the Police Department to maintain law and order except by the free use of firearms.’ They went on to argue that only the presence of federal troops could resolve the crisis. Not surprisingly, MacArthur now executed his orders in a manner seemingly designed to maximize media attention. In a highly unusual but characteristic decision — one purportedly against the advice of his aide, 42-year-old Major Dwight Eisenhower — he chose to oversee the operations in the field with the troops. Military protocol called for a commanding officer to remain at headquarters. This was especially true for MacArthur, whose post was administrative rather than operational. So while he charged General Perry Miles with carrying out the eviction, MacArthur assumed the real responsibility. Although no other situation offers an exact comparison, MacArthur’s action was as if General Maxwell Taylor, the head of the Joint Chiefs of Staff in 1963, had led National Guard troops to the University of Alabama to confront Alabama Governor George Wallace. Having driven the veterans from the downtown area, MacArthur had fulfilled his mission. But whether his blood was up, or he merely sensed a need to inflict a coup de grâce against the purported Communist element — an enemy he considered more insidious than disgruntled veterans — MacArthur did not rest on his laurels. He ordered his troops to advance upon the 11th Street bridge leading to Anacostia Flats. Someone, waving a white shirt as a flag of truce, came racing across to plea for time to evacuate the women and children. MacArthur granted an hour’s reprieve. Though accounts differ, the president now seemed suddenly to exhibit an untimely case of nerves. Fearing repercussions, he twice sent word that the Army was not to cross the bridge. MacArthur refused to listen, saying he hadn’t time to be bothered by people coming down and pretending to bring orders. He sent the troops across against explicit instructions. Using more gas, the soldiers moved into Bonus City. Its occupants fled in terror, refugees rousted from their pitiful camp. ‘One of the soldiers threw a bomb,’ said one woman hiding in a nearby house with her family. ‘…[W]e all began to cry. We got wet towels and put them over the faces of the children. About half an hour later my baby began to vomit. I took her outside in the air and she vomited again. Next day she began to turn black and blue and we took her to the hospital.’ Either veterans or soldiers torched the entire area — no one knows for sure. In the confusion, one baby was left behind, dead from gas inhalation. Endeavoring to eliminate any doubt as to his motives, MacArthur next conducted an impromptu press conference — a job more appropriately left to civilian authorities. The conference allowed the general to expound on the claim that Reds had concocted the riot, the president’s safety was at stake, and the government was threatened with insurrection. Describing the mob, MacArthur said: ‘It was animated by the essence of revolution. They had come to the conclusion, beyond a shadow of a doubt, that they were about to take over in some arbitrary way either the direct control of the government or else to control it by indirect methods. It is my opinion that had the president let it go on another week the institutions of our government would have been very severely threatened.’ It was a masterful performance. In praising the president and war secretary, MacArthur nearly absolved himself of responsibility — perhaps a calculated move. Hoover watched the red glow of the bonfire at Anacostia Flats from a White House window. If he had second thoughts, he didn’t include them in his record of the event; and in any case, it was too late. MacArthur’s boldness had boxed him into a corner. The president’s best option now was to vigorously support the general. Hysteria colored much of Washington’s official view of the Bonus Army. In defense of both men, MacArthur and Hoover seem to have genuinely believed that Communists controlled the organization, with Walter Waters merely serving as the Bonus Army’s titular head. Hoover believed that veterans made up no more than 50 percent of Bonus Army members, while MacArthur set an even lower number — 10 percent. Waters said that was a ‘damned lie.’ While Communist operatives certainly tried to infiltrate the ranks of the Bonus Army and instigate trouble, evidence indicates they had little real influence. The president and Army chief of staff’s estimates were badly overstated. A postevent study conducted by the Veterans Administration revealed that 94 percent of the marchers had Army or Navy service records. Nevertheless, the Communist Party was happy to take credit for what was billed as an uprising. Events elsewhere help explain Hoover and MacArthur’s state of mind. Students loudly interrupted the general’s commencement address at the University of Pittsburgh that summer as he spoke against demonstrators protesting the government. More alarming, a union-inspired hunger march at a Detroit auto plant that spring had turned ugly. Police killed four civilians while trying to maintain control, injuring 60 others. Communist Party leaders retaliated, organizing a 6,000-man funeral procession, waving red banners and marching in cadence to the party’s anthem, the ‘Internationale.’ Fearing a similar or worse result in Washington, Hoover and MacArthur acted with dispatch when confronted by a large group of disgruntled citizens. Throughout their lives, both officials clung stubbornly to the claim that subversive elements bent on destroying capitalism were behind the veterans. Neither man ever accepted the Bonus Army as primarily a group of destitute, desperate, hungry men trying to support their families. The day’s toll was three dead, 54 injured and 135 arrests. In the rush to point fingers, in addition to the Communist element, Congressman Patman and colleagues received their share of the blame. The Chicago Tribune editorialized that responsibility for the incident ‘lies chiefly at the door of men in public life who have encouraged the making of unreasonable demands by ex-service men and inflamed their mistaken sense of judgment.’ But Alabama Senator and future Supreme Court Justice Hugo Black directed his venom at a different target. The public soon followed Black’s lead. Frustrated by Depression-era economics and in tune with Franklin D. Roosevelt’s comparatively more aggressive assistance programs after he assumed the presidency, the public increasingly questioned the government’s response to the plight of the Bonus Army. Many came to see it as callous and heavy-handed. Theater audiences reacted to Bonus Army newsreel footage with choruses of boos. Likely influencing the judgment of historians was MacArthur’s demonstrated knack for upsetting his supe-riors. Twenty years after the Bonus Army incident, President Harry Truman would relieve the general of his Korean command for perceived insubordination. In the end, the general’s personality and ambition proved too great an obstacle for history to erase its view of his performance against the Bonus Army. Along with MacArthur, two other soldiers who participated in the action would go on to write their names large in history — Eisenhower and Patton. Eisenhower would eventually undergo an even more dramatic transformation than his boss in describing the affair. Normally a frank diarist, Ike merely noted at the time that he ‘took part in Bonus Incident of July 28,’ and went on to say, ‘A lot of furor has been stirred up but mostly to make political capital.’ By the time he published At Ease 30 years later, Ike portrayed himself as a frustrated hero of sorts, claiming that he tried to dissuade MacArthur from personally leading the charge. He advised him that Communists held no sway over the marchers, and he reiterated the old claim that his boss ignored White House orders to halt operations. Interestingly, Ike waited until after MacArthur’s death in 1964 to present this version. If it distorted history, MacArthur was not around to contest it. It was a messy affair for everyone. Patton, a man who revered duty, had mixed emotions, calling it a ‘most distasteful form of service.’ Within months he criticized the Army’s tactics, believing they violated every precept of how to handle civil unrest. Still, he commended both sides: ‘It speaks volumes for the high character of the men that not a shot was fired. 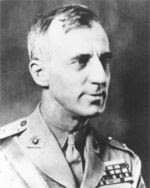 In justice to the marchers, it should be pointed out that had they really wanted to start something, they had a great chance here, but refrained.’ And while Patton was disgusted that ‘Bolsheviks’ were in the mix, he considered most of the Bonus Army ‘poor, ignorant men, without hope, and without really evil intent.’ To his dismay, the routed marchers included Joseph Angelo, who 14 years earlier had saved the wounded Patton’s life by pulling him to safety from a foxhole. Hoover’s Democratic challenger in that fall’s presidential election, Franklin D. Roosevelt, understood the political significance of the president’s use of force. Like his opponent, the New York governor did not support payment of the bonus, but he found Hoover’s tactics appalling. ‘He should have invited a delegation into the White House for coffee and sandwiches,’ Roosevelt told one aide as he perused the morning papers. Already confident of success, Roosevelt now felt victory was certain. This was a black eye no one could overcome. Roosevelt won decisively, capturing 42 states with 472 electoral votes compared to just 59 for his Republican rival. Hoover had no illusions, but he could not help but feel bitter. Stopping just short of calling Roosevelt a liar, the former president later wrote of the campaign: ‘This whole Democratic performance was far below the level of any previous campaign in modern times. My defeat would no doubt have taken place anyway. But it might have taken place without such defilement of American life.’ The vision of Regular Army troops marching on veterans would provide propaganda for the Left for years to come. Long before that, the remnants of the Bonus Army drifted home, stopping for a brief period in Johnson, Pa., until that community too urged them on. The government buried the two Bonus Army veterans slain by police at Arlington National Cemetery with full military honors. One year later, another contingent of veterans came to Washington to press the issue of the bonus payment. The new president was no more receptive than the last, but instead of the Army he sent his wife, Eleanor, to speak with the former servicemen. More important, he created the Civilian Conservation Corps, which offered the men employment. And three years later, Congress passed legislation over FDR’s veto to complete the bonus payment, resolving one of the more disturbing issues in American politics. This little book is important because it is revolutionary thinking. To appreciate its value correctly, we should remember the World Revolution’s career so far. A declaration that liberty, as real as life, is the nature of “all men,” challenged the basic belief and the practical arrangements of the whole world. And to defend it these low-class underlings rose, “a rabble in arms,” and defied the world’s Great Powers. For their discovery of the natural liberty of “all men” was world-revolutionary. The world of God-Kings, of Ruling Classes and wretched peasants, serfs, slaves enduring brutality, hunger, misery, could not survive that discovery. Again and again, through the long past, leagues of nations had failed. This was a league of “all men,” based on the nature of man; so in time, as its makers thought it must, it could be a federation of all mankind, a new world of free men. Including Eskimos. Now a strange thing occurred. In the source and center of this real World Revolution, the men who were making it — forgot it. Three generations of free men, while overcoming the fierce resistance of a wild continent, actually created here a wholly new way of human life, never before imaginable. Men engaged in this stupendous task put their whole minds into it. And the minds of American intellectuals remained in the Old World, with the thinkers who were reacting against the Revolution. In the 1830’s and 1840’s, active Americans were annexing the Republic of California. Americans in northern Mexico, at San Antonio and San Jacinto, were fighting and dying for freedom and their dream of the Lone-Star Republic of Texas. At Yale, an honored guest, the French socialist Fourier, was enthralling his learned audiences with his visions of a Socialist World, and New England’s intellectuals were fondly trusting that their Brook Farm commune was a beginning of the future Communist World Commonwealth. It wasn’t. The Revolution was arousing reaction against it, everywhere in the Old World, from Mexico in 1820 through all South America, to Italy in the 1860’s, Germany in the 1880’s, China in 1911, Russia in 1917. The whole Old World was wrecked. That ancient world of rulers and ruled, tyranny and slavery, poverty, misery, famine, torture, human degradation, was smashed by its violent reaction against the discovery that “all men” are endowed by their Creator with liberty, as real, as inalienable from a living person as life itself. A century of heedless builders and reactionary thinkers has had reactionary effects even within this Republic. Too many Old World fallacies have been believed here, too many Old World measures imitated. Apparently only one lone newspaperman, Mr. Haskell, of the Kansas City Star, recognized the “New” Deal as a stale imitation of ancient Rome in its decline. But the source and center of the World Revolution is still in this revolutionary Republic, this only successful league of States, the first ever made to defend every person’s human rights: life, liberty, property. A real World Revolution is not to be won in two centuries. The reaction against it has wrecked the whole Old World. It wrecked France and retreated to Germany; wrecked Germany and retreated to darkest Russia and stagnant China. It can retreat no farther; now is the showdown. Now the struggle between the old, barbarous past and the new, possible future involves the whole human world and every one of us alive. The basic question, on which the answers to all other questions depend, is: What is the nature of man? The only political question is: What is the nature of the institution named “Government”? It is a simple fact that all men’s future for centuries is being determined by the answers that Americans give to these fundamental questions. We have it in our power to make a new world. There has not been such a responsibility since the time of Adam. So I would ask you to sharpen your own thinking on Mr. LeFevre’s genuine thought about these questions. The value of this little book is its contribution and its stimulus to true revolutionary thinking. I think you have not read its like before. If it jolts you, that’s good; these are the times when minds need waking up. Let nothing keep you from it any longer. From Glenn Beck via YouTube. This clip is Part 3 of a three-part series; here is Part 1 and Part 2. New Hampshire fired the first shot. Although 7 other states have similar pending resolutions and bills, the Oklahoma House is the first to actually pass one. Another 27 states are expected to make similar moves in the coming months. That’ll leave the country split 71-29. Now, before you get too excited, bear in mind that all of this was likely Obama’s goal. To bait us into rebellion. Boiled down, all of these state measures are threats of secession. Recall, if you will, Obama’s obsession to be the 21st Century Abraham Lincoln, and his ominous calls to recreate and rebuild America. Who was Lincoln? Why, he was the man who “preserved” the Union by way of implementing military force against states that had seceded. Lincoln knew full well that he would not be preserving the Union, but that he would be conquering sovereign nations, nations whose cultures and ideologies he would then have to destroy, and then remake, in the image of the North’s, in order to maintain their subjugation. And that is precisely what happened in the aftermath of Lincoln’s war of aggression. He didn’t preserve the Union, he changed it forever and handed unprecedented powers to the Federal Government. The Lincoln household was most characterized by a dark spirit, an unyielding pall of gloom. He was plagued by mysterious and absolutely crippling headaches. Three of his sons were struck dead before age 20. His wife slowly went insane, the result of a ceaseless, degenerative depression. Lincoln was assassinated. Now I’m going to run with a theory. So, what if Obama, Soros and Emanuel understand fully that our current, sudden, violent lurch into Socialism will not be tolerated by many to most of the American people, and that these people may possess sufficient physical concentration in order to secede in large territorial chunks, including those already defined by current state borders? They understand that they will be facing a crisis, right? Well, what is a crisis to the current Marxist regime of Obama other than an opportunity? Based on Emanuel’s stated philosophy, one can conclude that he and Obama seek the greatest crisis that they can possibly create. And this is it. Civil war born of broad secession is the Mother of All Crises, and therefor it is the nirvana of all crises. The current regime seeks civil war just as it seeks oxygen and food. And the actions of Abraham Lincoln provide the precise blueprint by which Obama can achieve all of his life ambitions. They provide the map with which he can navigate to the zenith of personal power, the desired destination of every narcissistic psychopath. Yes, he is a dedicated Marxist, but only insofar as Marxism is his chosen vessel to reach his ultimate goal of Absolute Power. He will defend Marxism until the day he dies, for Marxism is the only means by which he can be king, and being king is the only reason for which he lives. The epitome of change? Yes. Now, how does Obama achieve and maintain the goals laid out in the paragraph above? Implementing Marxism by legislation in a pluralistic democracy is not sufficient to maintain the reigns of both Marxism and a Marxist leader. They can be voted and legislated away. Capitalism can then return as the controlling process of the economy. Any Marxist who let things stand as such would be committing a fatal crime against Marxism. As such, Obama can not let America stand as a pluralistic democracy. If he is to follow his duty to his Allah, one Karl Marx of Germany, he must terminate pluralistic democracy. In order to achieve this, he must first adopt the assumption that this can only be achieved by force. This is a highly convenient assumption, given that in order to maintain a Marxist dictatorship, he has to establish a paramilitary police state, along with a plausible rationale for its existence. There is one swift way to achieve all three goals. Civil war. All he has to do is create an excuse to wage literal war on those who would oppose him. This allows him to suspend democracy, crush his enemies, and establish a permanent police state, with the excuse to the American people that all of the above were done in order to preserve the Union. (The permanence of the police state will be secured by the slogan “Never Again”.) An updated version of Lincoln’s playbook, through and through. For Obama, in order to catalyze a civil war, he must first create a crisis of secession or rebellion. He intends to do so via a mix of irresponsible, crisis-creating government, and legislative implementation of the first stages of absolute Marxism. These two will be sufficient to create a rebellion against his government. The rest will follow naturally. The simplest remedy for this? For the employees of the Federal Government to refuse to work for him. No secession, no rebellion, no bloodshed, just a man who gave a war, but nobody came. WHEREAS, a number of proposals from previous administrations and some now pending from the present administration and from Congress may further violate the Constitution of the United States. THAT the State of Oklahoma hereby claims sovereignty under the Tenth Amendment to the Constitution of the United States over all powers not otherwise enumerated and granted to the federal government by the Constitution of the United States. THAT this serve as Notice and Demand to the federal government, as our agent, to cease and desist, effective immediately, mandates that are beyond the scope of these constitutionally delegated powers. THAT all compulsory federal legislation which directs states to comply under threat of civil or criminal penalties or sanctions or requires states to pass legislation or lose federal funding be prohibited or repealed. THAT a copy of this resolution be distributed to the President of the United States, the President of the United States Senate, the Speaker of the United States House of Representatives, the Speaker of the House and the President of the Senate of each state’s legislature of the United States of America, and each member of the Oklahoma Congressional Delegation. COMMITTEE REPORT BY: COMMITTEE ON RULES, dated 02-12-09 – DO PASS, As Coauthored. Worried the federal government is increasing its dominance over their affairs, several states are pursuing legislative action to assert their sovereignty under the 10th Amendment of the Constitution in hopes of warding off demands from Washington on how to spend money or enact policy. The growing concerns even have a handful of governors questioning whether to accept federal stimulus money that comes with strings attached. The sentiments to declare themselves legally independent from Washington have swept across as many as a dozen states, renewing a debate over so-called unfunded mandates that last raged in the 1990s. The states question whether the U.S. government can force states to take actions without paying for them or impose conditions on states if they accept certain federal funding. “We are telling the federal government that we are a sovereign state and want to be treated as such. We are not a branch of the federal government,” said Arizona state Rep. Judy Burges, who is leading an effort in her state to pass a resolution called “Sovereignty: the 10th Amendment.” Ms. Burges was inspired to action by a pair of Bush administration initiatives: The No Child Left Behind education law of 2002 and the Real ID Act, a 2005 law that established national standards for state-issued driver’s licenses and identification cards. In other states, lawmakers say they are bracing to repeal federal mandates to spend their money that they expect will emanate from Washington once President Obama begins delivering some of the big-ticket programs promised during his presidential campaign. Other states pursuing sovereignty resolutions are Hawaii, Michigan, Missouri, Montana, New Hampshire and Washington. Similar measures are likely to be introduced in more than a dozen other states, analysts said. “The states are sending a message,” said Robert Alt, a legal scholar at the Heritage Foundation. The nearly $800 billion stimulus bill also has raised worries. Republican governors Mark Sanford of South Carolina, Bobby Jindal of Louisiana and Rick Perry of Texas expressed reservations this week about accepting their states’ shares of the stimulus package because they are worried that the federal government will impose conditions on how it can be spent. As a self-styled staunch conservative, Mr. Sanford, the new head of the Republican Governors Association, aggressively opposed the stimulus plan. However, in a Thursday morning interview on CBS’ “The Early Show,” Mr. Sanford said his state would accept money from the stimulus bill. Opposing the plan “doesn’t preclude taking the money,” said Mr. Sanford. South Carolina’s 9.5 percent unemployment rate is the nation’s third-highest.